Clive Owen, Lothaire Bluteau, Ian McKellen, Mick Jagger, Brian Webber (II), Jude Law, Nikolaj Coster-Waldau, Gresby Nash, Suzanne Bertish, David Meyer, Stefan Marling, Richard Laing, Crispian Belfrage, Johanna Kirby, David Phelan. Bent is the powerful and moving film adaptation of Martin Sherman’s award- winning stage play. For almost 20 years Bent has stunned theatre audiences around the world. Now adapted for the big screen by the author himself, this inspiring tale of love over oppression has even greater power and poignancy. Set amidst the decadence of pre-war fascist Germany, Bent is an emotional tale of love, as three homosexual men fight for survival in the face of persecution. The story begins during the “Night of the Long Knives”. Max (Clive Owen) and Rudi (Brian Webber) are enjoying an evening’s entertainment in Greta’s Club. Whilst watching Greta/George (Mick Jagger) perform, the two men fall into the hands of Hitler’s men. Their escape forces them to spend two years on the run begging help from reluctant friends and relatives; such as Uncle Freddie (Ian McKellen). Finally they are caught and sent to a detention camp. Within the confines of the camp Max meets and falls in love with Horst (Lothaire Bluteau). Their secret love affair, which begins under the most extreme regime, is as inspirational as it is emotional. Bent illustrates how the selfless love of one person for another can overcome oppression, even under the most extreme circumstances. The story of Bent is a hugely significant within contemporary ‘gay’ culture The play was first performed at London’s Royal Court Theatre in 1979. Mark Sherman had written the play with Ian McKellen in mind and the debut staging starred McKellan and Ton Bell McKellan won the ward for Best Actor in a New Play from The Society of West End Theatres for his performance of Max. The play itself caused an uproar. Although the critics were not unanimous in their praise, audience responded emotionally and intellectually to the subject matter, and were affected by the strength of the writing. Ian McKellen comments, ‘The play educated the world about the pink triangle. Audiences knew very little about the treatment of homosexuals under the Third Reich, because camp survivors discovered on their release that the same laws were still on the statute books of Europe, and that they had been imprisoned for something that was still considered a crime in many countries”. Adds Sherman, “The play caught on to something that was happening at that time and it said things that were not being said to a wide audience in mainstream theatre.” To date Bent has been performed in over thirty five countries. Following the Broadway production in 1980, which starred Richard Gere and then Michael York, the film rights were optioned and, at different stages, a number of directors were attached to the project, including Costa Gavras and Fassbinder. When Martin Sherman was approached by Michael Solinger and Sarah Radclyffe regarding the rights, his response was that he would only be interested in adapting the play for the screen if Sean Mathias directed. Radclyffe and Solinger responded with enthusiasm to this suggestion and, with Mathias attached to direct, the producers raised the finance from Channel Four Films. Nippon Film and Development Finance Inc. and the Arts Council of England. Sherman chose Mathias as director, knowing that he would bring a unique visual sense, which would lift the play for the big screen. In writing the play, Sherman used the interval as a deliberate device to separate the two halves of the story and he was aware that the film audience, denied an interval, must see the two halves flow into each other seamlessly. “The second half of the play, where the two men are incarcerated in a camp, is deliberately claustrophobic, but the screen version must open up so that the characters are not dwarfed by their unsympathetic surroundings.” he explains. Sean Mathias had been influential in persuading Ian McKellen to accept the role in the original stage version of the play in 1979. Ten years later, Sherman and McKellen staged a single performance of the play in aid of The Stonewall Group, an organisation that aims to establish equality for lesbians and gay men in the UK. Sean Mathias directed a cast which starred Ian McKellen as Max, Michael Cashman as Horst, Alex Jennings as Rudy and Ian Charleson as Greta, the night dub owner. Among the supporting roles were Ralph Fiennes and Richard E Grant as Nazis, with around 120 actors on stage for the Dachau scenes. Richard Eyre, then director of the Royal National Theatre, attended the event and subsequently invited Sean Mathias to direct a new production at the theatre, again starring Ian McKellen and Michael Cashman. Mathias was delighted to be invited to direct the film. “The subject matter has a volatile nature perfect for the dynamic form of cinema. The theme is universal in its metaphorical sense and hugely important in its political and historical genre.” Mathias always imagined the film stylistically using strong expressionist feel in design and setting, with thriller paced narrative driving the story along. Designer Stephen Brimson Lewis has worked extensively in theatre with Mathias and was nominated for Tony Awards for the director’s Broadway production of Indiscretion (Les Parents Terribles) in two categories – costume and settings. Together they agreed that they would offer their visual and imaginative interpretations of Berlin and the Camps, rather than attempt to recreate these in a naturalistic way. Greta’s night-club in pre-war Berlin was staged in the ruins of Braehead Power Station, on the banks of the River Clyde outside Glasgow. With tumbling concrete pillars and huge over-powering gates, the building in many ways echoed the confines of a Camp, hinting that Berlin itself was about to turn into a kind of concentration camp from which few of the unique artistic denizens of that time would emerge intact. The streets of Berlin were found among Glasgow’s greyest tenement buildings. The site for Dachau was a disused cement factory in Tring, Hertfordshire, echoing the fact that the camps were often industrial buildings, hastily adapted for their sinister purpose. 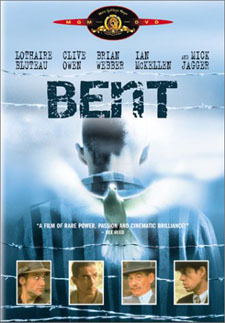 Bent won the prestigious ‘International Critics Award’ at the 1997 Cannes Film Festival. Channel Four Films presents in association with NDF Inc/Ask Kodansha Co Ltd and The Arts Council Of England, BENT. Starring: Lothaire Bluteau, Clive Owen, Brian Webber, Ian Mckellen and Mick Jagger. Co-produced by Sean Mathias and Martin Sherman. Executive Producers: Sarah Radclyffe, Hisami Kuroiwa. Production Designer: Stephen Brimson Lewis. Director of Photography: Yorgos Arvanitis AFC. Produced by Michael Solinger and Dixie Linder.